Alciato at Glasgow: Emblem: Albutii ad D. Alciatum, suadentis, ut de tumultibus Italicis se subducat, & in Gallia profiteatur. Albuce à Alciat, luy suadant se retirer des troubles d'Italie, & prendre party de faire lecture en France. Venit ab Eoo Persidis axe priùs. In patria: hîc nobis dulcia poma gerit. Alciate hinc vitam degere disce tuam. Multum corde sapis, nec minus ore vales. The tree that gave us these fruits, a stranger to our skies, came formerly from the eastern climes of Persia. By the transplanting it was made better. The tree that once bore harmful fruits in its native land, here bears sweet ones for us. It carries leaves like a tongue, fruits like a heart. Alciato, learn from it how to spend your life. Far from your own country, you will be held in greater esteem. You are wise in heart, and no less effective in speech. de faire lecture en France. Des Pesches de bon goust, & de fort bonne sorte. Et son fruit est au coeur aussi bien ressemblant. Le coeur plein de sçavoir, la langue pour bien dire. esté quant & quant doué d’une grande prudence. 1. This person has been identified as Aurelius Albutius, lawyer, scholar and poet, like Alciato originally from Milan. On the question of the genuineness of this ascription and a suggested date for the epigram preceding Alciato’s first removal to France in 1518, see J. Köhler, Der ‘Emblematum liber’ von Andreas Alciatus (1492-1550) (Hildesheim: August Lax, 1986). 2. 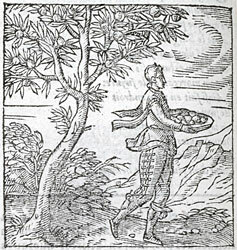 ‘The tree that gave us these fruits’, i.e. the peach, with its heart-shaped fruit and tongue-shaped leaves. 3. ‘Far from your own country’. Alciato had two periods in France. He was lecturing on Civil Law in Avignon from 1518-1522, then returned to Milan. He again took up his teaching post in Avignon in 1527, and then removed to Bourges, where he remained until his return to Italy (Pavia) in 1533. The ‘troubles’ mentioned could be political (there was much fighting and tumult in N. Italy), or could refer to the wrangling between rival schools of academic lawyers during Alciato’s youth.